IEGS is located in the heart of Södermalm in Stockholm. The school has a strong academic and multicultural tradition and is committed to helping you develop to your full potential. You can choose to study one of four Swedish national programmes or the International Baccalaureate (IB) programme. All programmes offered at the school qualify you for university studies in Sweden or abroad. All courses at IEGS, except from Swedish, civics A, law and modern languages, are taught in English. Internationella Engelska Gymnasiet believes that every student has the capacity to develop intellectually, morally and personally. The pedagogy at IEGS is based on a work ethic where involvement comes through hard work, commitment, dedication and creativity. Something that is imperative for academic development and for understanding the world we live in is intellectual curiosity. At its heart IEGS is motivated by a mission to create a better world through education, develop young people who are reflective learners, courageous thinkers and curious about the world around us and prepare students for the world of today as well as tomorrow. Internationella Engelska Gymnasiet is located in Södermalm, Stockholm. 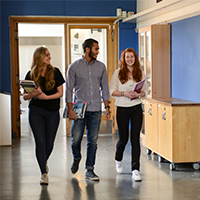 You can choose to study the IB programme or one of four Swedish national programmes at the school. The courses at IEGS are taught in English. In this video you'll get to hear some students at the school explain why you should choose IEGS! In chapter 2, 17§ of the Swedish school law, a permanent exception from Swedish teacher certification is granted for those teachers schools employ to teach in English and who have a teaching degree from their home country. Fyll i dina uppgifter om du är intresserad och vill bli kontaktad av Internationella Engelska Gymnasiet Södermalm.